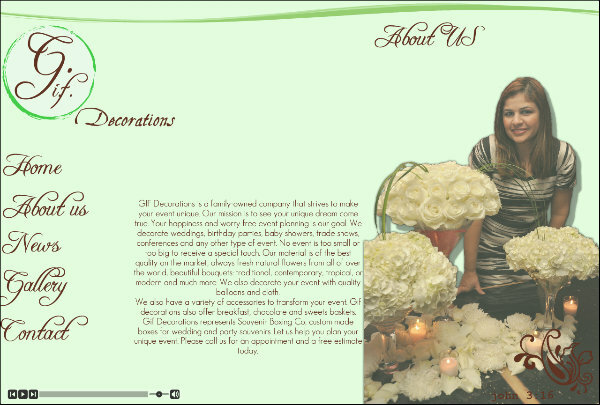 GIF Decorations is a family-owned company that strives to make your event unique. Our mission is to see your unique dream come true. Your happiness and worry free event planning is our goal. We decorate weddings, birthday parties, baby showers, trade shows, conferences and any other type of event. No event is too small or too big to receive a special touch. Our material is of the best quality on the market, always fresh natural flowers from all of over the world, beautiful bouquets: traditional, contemporary, tropical, or modern and much more. We also decorate your event with quality balloons and cloth. We also have a variety of accessories to transform your event. Gif decorations also offer breakfast, chocolate and sweets baskets. Gif Decorations represents Souvenir Boxing Co, custom made boxes for wedding and party souvenirs. Let us help you plan your unique event. Please call us for an appointment and a free estimate today.